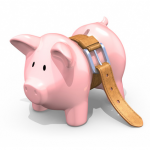 Recently a survey showed that 40 percent of Americans say that the uncertainty of the economy and the flimsiness of the stock market have gotten them tightening their belts and reducing expenses. Indeed it isn’t hard to see why. In just the course of two months, the economy has brought shocking news that are giving off warning signals to an impending second recession. First, the political gridlock in Washington D.C. over the debt ceiling has resulted in the downgrade of the US credit rating given by the agency Standard & Poor’s. Then the annual growth of the US economy showed a poor 1% performance, which is much slower than anyone anticipated. Finally, the United States continued on with employment problems as job availability went to a net of zero percent. If that’s not enough, the stock market has been showing such poor performance lately with a 15.8 percent loss by the Dow Jones Industrial Average in the first week of August. This however improved by the end of the month with only a 4.3 percent loss but then eventually plummeted again by the first week of September. The economic crisis isn’t also just confined to the United States, sovereign debt has continued to rise in countries such as Portugal, Italy, Spain, Greece and Ireland. With these news combined, consumers have begun to get worried making them think twice before taking cash out of their wallets. Despite these economic news however, 58% of the survey respondents are unaffected. They say that these news have not affected their spending habits. The survey also showed that women were more prone to tightening their purses than men, with a 43% for women and only 34% for men. For the working population, the economic instability has also not affected their spending as much as those who are nearing retirement. Consumer spending can contribute a lot to the betterment of the economy. Sometimes the government can rely on this to keep businesses going. Hopefully the economic instability will have consumers lean more towards investing than hoarding their cash to result in better growth of the United States.